Freshwater Lakes around Berlin (and in the rest of the world) are always layered in thermoclines. This year the layers are in a different depth than last year and the visibility is lower than the years before. Always wear a wetsuit with a hood. If you want to stay longer in the depth below 10m wear gloves and neoprene socks. You will get shocked without and breath holding is getting difficult. The first layer from the surface is according to the weather and could be up to 25°C in the Summertime. The second layer starts at ~5m and is ranged from ~12° to 8°C. The third layer is the darkest, has a temperature from 6° to 4°C and begins mostly between 10 and 12 meters depth. So choose a warm suit (5mm plus) for your purposes that match the temperature belongings. Be prepared for a limited visibility if you pass a thermocline layer. Dive slowly, be prepared to notice obstacles to late. Keep your eyes open. Use a float and a rope to avoid losing orientation if the visibility is to low for a free fundive. If you are just “snorkeling” and want to watch the different kind of fishes and underwater life stays above the second layer between 3 and 6 Meters. In this area you will find the best visibility that the lake provides. Staying near the reed also a provides a good view of life in the lake. Everything below the 12meters is a moonscape. There is no need for searching for large fish as you will not find them past this point. A lot of species in this lakes are under nature conservation. Always take care of the nature, the environment and the plantation. It’s forbidden to be destructible amongst the reed and the environment, most shells are under nature conservation along with most other lake creatures. ALWAYS WEAR A KNIFE OR SCISSORS. Sometimes you will find fishing lines under water and YOU CAN’T TEAR THEM APART WITH YOUR HANDS. German law allows for use of small knifes with a max. blade length of 12cm. Don’t touch anything on the bottom you can’t identify. There are still AMMUNITION REMAINING in the lakes around Berlin left from wwII. The Allied Forces use the lakes to dispose the german military waste after the end of the war. The German government cleaned 99% of this remaining time bombs out of the lakes but ammo is still found. A bigger problem are hidden and unexploded bombs from the Allied Forces bombings 1944-19945 to end the war and that still can be found at unexpected places inside the lakes. Report found ammo to the police, they will redirect this to the bomb disposal teams who will contact you for a position fixing before removing. The ground of the most lakes is a summary of sunken sediments. Many lakes are containing of lot of hydrogenic carbonate that will get transformed by biogenic descalers from some species of underwater plants that will use the carbonid dioxid for their adequate nutrition. You can see a lot of white points, floating in front of your mask in the free water… which are “dancing” in the sunlight. This is part of the chemical reaction that this descalers left in water and many other small parts that are floating in the water. You can identify this plants by a white layer of this “broken” carbonate, which covers the leafs making them shine white. When you get in touch with the ground the visibility will deterioate rapidl, so avoid touching the buttom if you want to stay longer at this position. At some lakes you will find fishermen, please respect these guys. They are just trying to catch a meal. Keep distance enough, they often use strong fishing lines for strong fishes and can throw their bait really far away. A line can 100 meters long if they are using heavy lead behind the bait and most times they don’t use a floater for the surface. Mostely there is enough space in the water for both – freedivers and fishermen. Sometimes they will come to ask you if have seen big fishes and where they are momentary located under water after you are out of the water. I like it to give them true information about what I have seen at the last dive and look at them who they didn’t catch anything on this place. But with giving this information they respect us and are happy to get a snippet of information. Its raise the reputation for our hobby. You should handle it the same way. Be advised that freediving is categorized as “swimming” in Germany and not as a diving sport. So if Scuba diving seems to be forbidden in a lake but swimming is not prohibited you can put on your wetsuit and start freediving. Always take notice of the restrictions when you visit a lake under nature conservation. Spearfishing. The law for spearing is strict. It is forbidden in any freshwater to spear fishes. I noticed one time a group of scuba divers who had speared a big Esox. They get in troube with the officials for the hunt. So it’s not a good idea to wear a speargun with you in public. The penaltys are extremly expensive, so it doesn’t make any sense. In the end you have to pay a few thousands Euros. Thanks for reading our hints. Have fun and never overestimate yourself. 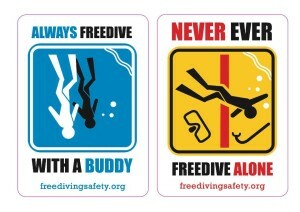 Stay alive and always have a dive buddy. Seems there is a bug in my style sheets… i will fix this asap.